Friends across Canada are invited to participate in an online course that will begin in mid-May. 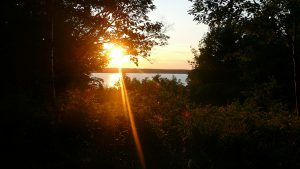 The course will address the early history of Friends, the history of Friends in Canada, the experiential nature of Quaker faith, the role of the Meeting in Quaker life, Quaker testimonies and their origin, and how our Quaker community nurtures how we live, work, worship, and transact business. This course was previously offered in 2012, 2015 and 2016. Although created to meet the needs of more recent attenders seeking to learn more about Quakerism, we believe that even longstanding members could benefit from this course. We welcome inquiries from anyone who would like to learn more about Quaker ways, with priority given to Canadian Yearly Meeting Members and Attenders. Participants will meet once a week for six weeks using either video conferencing or audio conferencing technology. If you are unfamiliar with conferencing technology, don’t worry, the facilitator and the Education and Outreach Committee are committed to making participation in the course as easy as possible for everyone. Participants will be asked to do a short reading before each of the sessions. These readings can be viewed anytime under Introduction to Quaker and Friends’ Ways. The course will include worship, active exercises, reflections from readings, and the application to one’s own life of what is learned. The course is free of charge. To indicate your interest, please click here to register by Friday May 12. We plan to begin the course the week of May 15 at a time that will be determined based on the results of poll to be completed with registration. 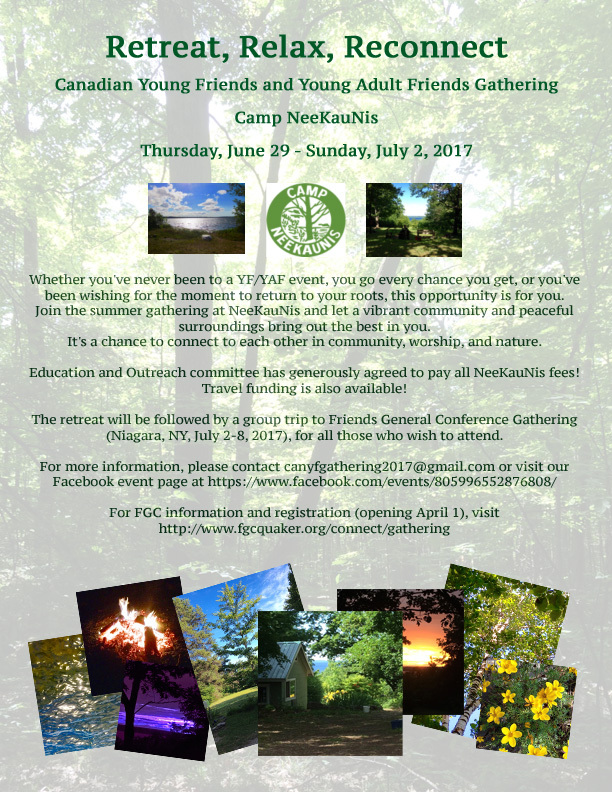 Preparations are underway for the Young (Adult) Friend Gathering at Camp NeeKauNis from Thursday, June 29 to Sunday July 2, 2017. We’re excited to bring a critical mass of Young Friends and Young Adult Friends together to energize and strengthen our community and rejoice in our time together in worship, play, and good conversation. We hope to rejuvenate the Canadian Young Friends community and discern our collective path forward, asking what we want to be doing and what makes sense for us. The gathering will welcome Young Friends and Young Adult Friends ages 13-35. Children of attendees are also welcome! Please share this poster and spread the word. We hope as many youth as possible can attend! For more details please contact canyfgathering2017@gmail.com or visit our Facebook page.